国歌："La marseillaise de la Commune"
^ Horne, Alistair. The Fall of Paris. The Siege and the Commune 1870-1. London, MacMillan. 1965: 331–332. ^ Rougerie, Jacques, La Commune de 1871.". "In March 1871 the Commune took power in the abandoned city and held it for two months. Then Versailles seized the moment to attack and, in one horrifying week, executed roughly 20,000 Communards or suspected sympathizers, a number higher than those killed in the recent war or during Robespierre’s‘Terror’of 1793–94. More than 7,500 were jailed or deported to places like New Caledonia. Thousands of others fled to Belgium, England, Italy, Spain and the United States. 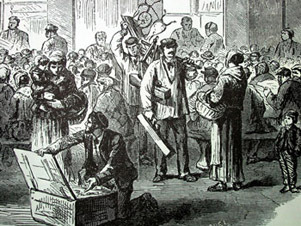 In 1872, stringent laws were passed that ruled out all possibilities of organizing on the left. Not till 1880 was there a general amnesty for exiled and imprisoned Communards. Meantime, the Third Republic found itself strong enough to renew and reinforce Louis Napoleon’s imperialist expansion—in Indochina, Africa, and Oceania. Many of France's leading intellectuals and artists had participated in the Commune（Courbet was its quasi-minister of culture, Rimbaud and Pissarro were active propagandists）or were sympathetic to it. The ferocious repression of 1871 and after was probably the key factor in alienating these milieux from the Third Republic and stirring their sympathy for its victims at home and abroad." ^ Estimates come from Cobban, Alfred. A History of Modern France. Vol 3: 1871–1962. Penguin books, London: 1965. Pg. 23. ^ V.I. Lenin, "Lessons of the Commune[永久失效連結]", Marxists Internet Archive. Originally published: Zagranichnaya Gazeta, No. March 2, 23, 1908. Translated by Bernard Isaacs. Accessed August 7, 2006. But two mistakes destroyed the fruits of the splendid victory. The proletariat stopped half-way: instead of setting about "expropriating the expropriators", it allowed itself to be led astray by dreams of establishing a higher justice in the country united by a common national task; such institutions as the banks, for example, were not taken over, and Proudhonist theories about a "just exchange", etc., still prevailed among the socialists. The second mistake was excessive magnanimity on the part of the proletariat: instead of destroying its enemies it sought to exert moral influence on them; it underestimated the significance of direct military operations in civil war, and instead of launching a resolute offensive against Versailles that would have crowned its victory in Paris, it tarried and gave the Versailles government time to gather the dark forces and prepare for the blood-soaked week of May. …Mindful of the lessons of the Commune, it [the Russian proletariat] knew that the proletariat should not ignore peaceful methods of struggle—they serve its ordinary, day-to-day interests, they are necessary in periods of preparation for revolution—but it must never forget that in certain conditions the class struggle assumes the form of armed conflict and civil war; there are times when the interests of the proletariat call for ruthless extermination of its enemies in open armed clashes. ^ 18.0 18.1 18.2 18.3 沈大力. 浩气长存：巴黎公社社员平反. 中华读书报2016年12月21日，第17版.